Here’s a little secret about the Internet: nobody knows if you’re an expert on a topic or not. I read lots and lots of websites over the course of the week. My chief goal, of course, is to find interesting ideas and recipes for my own site(s). While I sometimes point to larger organizations or more established food publications, I prefer to link to recipes by great bloggers with interesting perspectives on food and health. I will freely admit that not everyone is a great recipe writer (me included), but if you’re like me, you tend to use recipes as a guideline, not a bible. I read online recipes all the way through before I start cooking to make sure the steps outlined make sense in terms of the goal. A simple example would be a recipe that calls for rice as an ingredient, but doesn’t suggest *cooking* the rice until the last step. Your hot meal will wait around, sure, for the rice to steam, but that’s not really the goal. The Internet is also filled with writers who have questionable health-professional credentials. 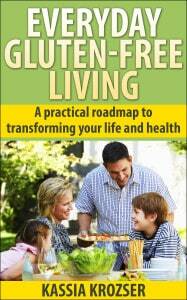 Yes, I write about the gluten-free lifestyle, as it’s how I live my life Every Single Day. But I don’t try to pretend I’m a medical professional. I don’t try to pretend I’m a registered dietitian. I don’t try to pretend I know what’s best for you. I *do* share my own experiences, successes, and failures, but always, always, always want you to check with professionals. It Tastes Like The Real Thing. I’m gluten free. You’re gluten free. We’ve eaten gluten-free substitutes for “real” bread or pastries. We’re not eating the real thing. Yes, there are good gluten-free breads and cookies out there, but breads, in particular, benefit from gluten. Gluten-free breads, in particular, rely upon a large number of different flours to recreate the experience. They never taste like “real” bread. Personally, I wish our community would stop trying to recreate the past. There are so many other delicious options that are also cost-effective. FYI — the only good exception I’ve ever found to this rule is gluten-free pasta made from solid grains such as lentils, buckwheat, or corn. Brown or white rice pastas (versus Asian noodles) tend to fall apart at the slightest provocation. It’s Easy. Gluten-free breads and pastries are a lot of things, but, if you’re trying to recreate the “real thing”, easy is not a word that comes to mind. Too many ingredients, too many steps, too much experimentation. When I opt for gluten-free baking, I go with recipes that are truly simple. I don’t have time for anything else. In fact, fairly soon, I’ll be posting a recipe for a gluten-free pizza crust that has only a couple of standard ingredients…no flour blends required! It Burns Calories. Lots of websites tout food that will burn calories or accelerate weight loss. And, it’s sorta true: there are foods that help accelerate calorie burn. However, the number of calories being burnt via these foods is small. Really small. Tiny, relative to the amount of calories involved in real weight loss. Add cayenne to your meal won’t hurt you at all, but a sprinkle of cayenne won’t help weight loss. My Original Recipe. Every now and then, I think I have genius recipe idea. To confirm my brilliance, I go to my friend Google to see what the Internet thinks of this, and I generally find that the Internet is filled with people who have the same type of genius I do. Digging further, I also learn that the Internet loves to copy other people. I subscribe to the belief that great artists build on the work of other great artists (as opposed to, you know, out-and-out plagiarism), but it doesn’t take long before you discover that recipes people claim as their own are actually copy-and-pasted from someone’s website, sometimes mistakes and all. When I’m contemplating a new recipe, I spend a lot of time researching flavors, techniques, and approaches, so when I finally develop my own recipe, it includes the thinking of others. It does *not* copy someone else exactly — my taste buds and aesthetic are my own, and my end result is mine. If you see a lot of recipes that are exactly the same from website to website, don’t trust that blogger’s experience (unless you are certain you have reached the ur-recipe). Brooklyn Stuff. I’m a Californian with a lot of Brooklyn friends. Brooklyn, for better or worse (and I’d argue both ways) is a trendy food place. It’s also a Very Young Person place, relatively speaking. The same sites that trumpet aquafaba (that chickpea liquid) are the one that tell you how to furnish your first apartment. Or when it’s time to get bangs. You know when it’s time to get bangs. We all do. Things that are trendy in one geographic area are not the be all and end all of reality. Cold Water Is A Shock To Your System. Lots of lifestyle writers love to start their day with a glass of lemon-infused water. I do, too. It’s a great way to jumpstart my daily intake (and since I don’t drink coffee, it’s a good ritual). Many bloggers will tell you that *cold* water is very hard on your system, that it makes your body work too hard (? ), or reduces the benefits of something-or-other. I cannot find any scientific evidence for this. There seems to be a school of thought that cold water slows down natural digestive processes; however, it takes minutes, at most, for the body to “heat” cold beverages to body temperature. If you like your water cold, drink it cold. I’m A [Professional], and I Never Do This: As you might guess, I’m not fond of so-called professionals making lifestyle pronouncements. Do This. Don’t do that. Eat this, not that. C’mon, you know and I know that there is no such thing as dietary perfection. I hate-read these articles because they’re not written by real people. I have a job. You have a job. We do the best we can, and articles written by people who “eat this in a day” are written by people who have way too much time on their hands. The Best Way to Peel an Egg. Okay, this is just for fun. It turns out *everyone* has a favorite, “best” way to peel an egg. Most of them work just fine, but there’s no perfect method. Use what works for you. What works for you, Kassia, you ask? I cook the eggs, I plunge the eggs into ice water for five to ten minutes, then I crack the shell until it’s pulverized all over, and remove the shell. Foolproof about 98% of the time. These are just a sample of lies you get from bloggers. Some of them may be based in fact — like, the calorie-burning foods — but their efficacy can be exaggerated. Others may reveal personal biases (cold versus room-temperature water). Or lack of rigor, as is the case of writers who steal recipes without bothering to fact-check the work. Just as we must always check labels to ensure we’re consuming safe gluten-free foods, it’s just as important to verify the information we see online to ensure the advice we get is accurate. This is critical not only for your health (how often have you seen a gluten-free recipe that includes gluten-containing ingredients?) but also your peace of mind. Go ahead, add a jalapeno to your meal…it’s going to add great flavor, but know that losing weight requires fewer calories in, more calories out. I mentioned it above, but want to say it again: when using an online recipe, perform a logic check. I do this my reviewing multiple recipes before settling on an approach. This ensures the dish works for my family, while allowing me to clarify best practices before I start cooking. Well, I’m certainly not going to give you an example of a bad recipe! These days I’m too excited about great food, and ways to make familiar meals feel fresh again. One thing I’m really into right now are fun salads, with pickled ingredients. One new favorite is pickled eggs. Colorful pickled eggs. Pink, yellow, purple, green…you get the picture (especially if you’re doing a Green Eggs and Ham thing). Pickled eggs add a bit of punch to a salad, and, yep, a lot of fun color. Recently, I helped put together a charcuterie platter that featured gorgeous pickled eggs. I’m particularly fond of a composed salad, like a Nicoise, and find it especially pretty with brightly colored eggs. While the recipe here suggests tuna steaks, canned tuna works just fine, trust me. Or, heck tofu. Or any other protein that floats your boat!